Hearing a poem, as opposed to reading it on the page, means you miss so much—the shape, the punctuation, the italics, even knowing how far you are from the end. Reading it on the page means you can go your own pace, taking it in properly; hearing it means you’re dragged along at the speaker’s own rate, missing things, not taking it in, confusing “there” and “their” and things like that. And the speaker may interpose his own personality between you and the poem, for better or worse. For that matter, so may the audience. I don’t like hearing things in public, even music. In fact, I think poetry readings grew up on a false analogy with music: the text is the “score” that doesn’t “come to life” until it’s “performed.” It’s false because people can read words, whereas they can’t read music. When you write a poem, you put everything into it that’s needed: the reader should “hear” it just as clearly as if you were in the room saying it to him. And of course this fashion for poetry readings has led to a kind of poetry that you can understand first go: easy rhythms, easy emotions, easy syntax. I don’t think it stands up on the page. There’s certainly a parallel here with the current state of poetry, which in its most-popular form gravitates toward spoken-word/SLAM. The prominence of both of these is a net positive for the literary community because by blurring the lines between poetry, oratory, and music (i.e. hip-hop), it’s made the genre more accessible to a wider audience. But it’s not without its stylistic problems (which I could lecture on at length). Often the medium overtakes the content, which as Larkin notes can lead to “easy rhythms, easy emotions, easy syntax” that, when transcribed, just don’t work on the page. Conversely, some of the best poetry ever written must be read — to name one example, John Berryman’s Dream Songs. There is just so much in his odd syntax and phrasings to be appreciated that it requires a slow read; when read aloud, it flashes past and by the end it feels as though you’ve only seen the surface beneath which something greater rumbles. Spoken word may allow the performer a spectrum of sounds and body movements, but the page offers just as much, if not more. This short note isn’t meant to privilege one approach over the other but is instead a reminder to think about the tools in our hands. Ask yourself: Why am I writing a poem and not prose? Is this piece meant to be performed, heard, or read? Simply asking these questions is what separates writers from those who merely write. material. 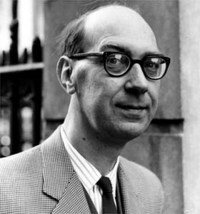 Philip Larkin on reading versus hearing poetry | A Prairie Populist short article is an outstanding instance.